Characteristically dodging undue attention and praise, Debbie Sharp is quick to point out that the idea wasn’t hers. But when a fellow member of the South Woodlawn Neighborhood Association suggested in 2011 they apply to the National Wildlife Federation for certification of their community as a wildlife habitat, Sharp was all in. With a background in horticulture and forestry, and a career spent working with others to solve problems, the project was a natural fit. Plus, it was her own neighborhood. When the woman behind the idea moved away, Sharp took over. The city of Knoxville as a whole is now seeking the same community wildlife habitat certification. In 2014, the year after her neighborhood received its wildlife designation, she became the city’s assistant neighborhood coordinator. When her boss, David Massey, retired this summer, she took his place. She is known for working long hours, attending neighborhood meetings and supporting residents in goals ranging from beautification and community-building to safety and emergency preparedness. This is just one volunteer project that, for Sharp, has morphed into a paying job. A “military brat” born in Turkey, Sharp grew up all over the world. The family moved back to their hometown of Knoxville after her father retired. Her parents, she says, taught her the value of courage, fairness and doing the right thing. It wasn’t until her grandfather died when Sharp was 10 that she felt his influence, too. After earning a degree in ornamental horticulture and landscape design and a master’s in forest recreation, both from the University of Tennessee at Knoxville, Sharp knew she wanted to raise awareness about the importance of open spaces but wasn’t sure what that meant in terms of a profession. She joined the Peace Corps, where she worked to protect the habitat of the Andean condor, held environmental education camps for youth and taught villagers in Ecuador to grow their own trees. It was the first time the 20-something Sharp had been away from home for an extended period, and she was the only American at the site. Her Spanish was adequate but not good enough for deep conversation. She missed her favorite music, her telephone, and the ability to shop at a store where the clerk spoke English. About a year after she joined the Peace Corps, she was walking through one of the public squares in Ecuador one day when she ran into an acquaintance who noticed the loneliness in her eyes and gave her a hug. The two became friends, and the woman’s family welcomed Sharp into their Ecuadoran home. “The kindness of people, and really feeling that deep down, having someone help you when you’re struggling – it just meant a lot to me,” Sharp says. 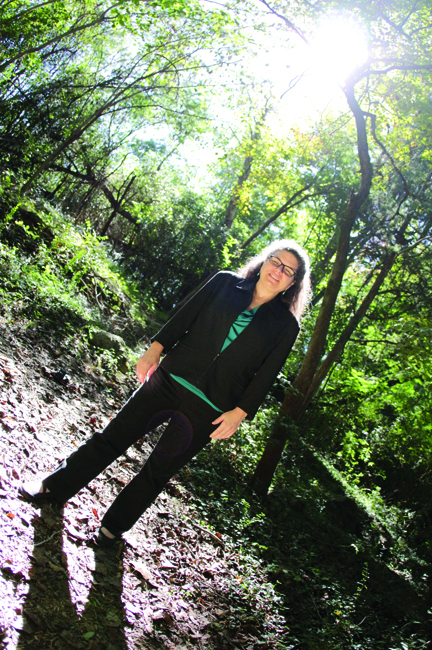 Debbie Sharp at Sam Duff Memorial Park, located in her South Woodlawn neighborhood in South Knoxville. Determined to pay it forward, she made a conscious decision to give back in her own community when her stint with the Peace Corps ended in 1996. After volunteering at the Sexual Assault Crisis Center (now Safe Haven) for six months, she was hired as education outreach coordinator, teaching elementary school children in Knox County how to identify and prevent bullying, harassment and assault. 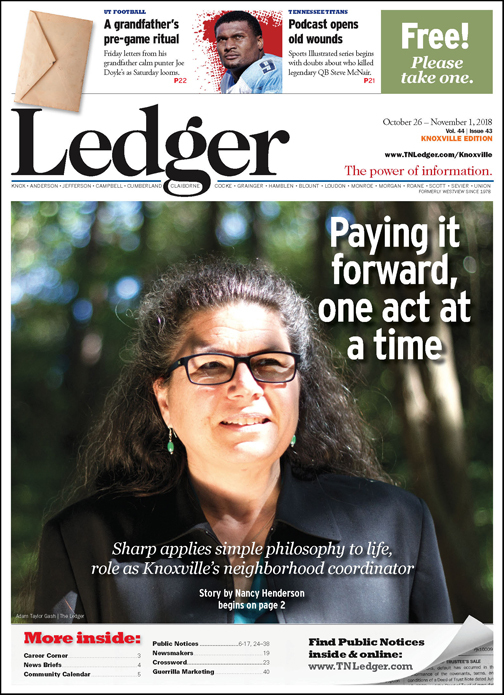 Even then, Sharp’s sense of compassion was obvious, says Terrin Kanoa, a property manager and former social worker who met Sharp during her time at the Sexual Assault Crisis Center and, years later, co-led monthly hikes with her in South Knoxville’s urban wilderness. Almost three years after Sharp began working at the Crisis Center, a USDA grant became available to help disadvantaged women boost their income at Narrow Ridge Earth Literacy Center, a nonprofit organization that promotes sustainability. As program director, she helped the ladies come up with ways to create saleable products, including salsas, jams and sauces, from the vegetables they grew in their organic gardens. But the funding was short-term. So, when Sharp learned of a job opening at Columbus House, a group home run by Catholic Charities of East Tennessee for boys who are in state custody because of abuse, neglect or other factors, she applied. Once again, she had already volunteered there, cooking and hanging out with the kids. To avoid a conflict of interest, Sharp did her foster parenthood training through a different company, then adopted two girls. The following year, she became the foster care coordinator at Catholic Charities. Her personal experience, she explains, gave her a deeper understanding of what the new parents needed to know. In her down time, Sharp continued to volunteer with the League of Women Voters and other nonprofit groups, including the South Woodlawn Neighborhood Association and the City’s Neighborhood Advisory Council. Not surprisingly, Sharp is an avid flower and vegetable gardener. She also loves hiking, cooking, traveling and reading. More unexpectedly, perhaps, is the fact that she plays drums and holds a fourth-degree black belt in Tae Kwon Do, although she admits her practice has slowed.